New Zealand hope to have their captain Brendon McCullum back from the third ODI against Pakistan on January 31, and their fast bowler Tim Southee for the home Tests against Australia in February. McCullum has been out of action since aggravating his back injury during the second ODI against Sri Lanka on December 28, while Southee suffered a foot injury during the third ODI against Sri Lanka on New Year's Eve. New Zealand coach Mike Hesson said Southee would not make it back for the remainder of the home series against Pakistan and the limited-overs games against Australia. Fast bowler Mitchell McClenaghan is not worrying about whether he will make New Zealand's World T20 squad, as he faces competition from team-mates Trent Boult, Tim Southee, Adam Milne and Matt Henry. "It's not on my mind," he said. "In the past I've thought about things too far ahead and worried about that kind of stuff. We're trying to make sure we focus on just the next game and prepare as well as possible." "I first came in as a new ball bowler and we've got a lot of guys who can swing the ball and take wickets at the top so my role's changing. There's more expectation of being able to close out the game and that's the kind of pressure that I love. I want to be that guy who can close out an innings and win games." The coach Mike Hesson said New Zealand were not just looking to choose the four best fast bowlers, but to pick people who could complement each other by performing specific roles. "Guys are going to have to play different roles. It's not a matter of playing our four best quicks, it's having balance among them that they can do different roles: opening, bowling in the middle and at the death." "Very happy. Mitch as a T20 bowler is experienced in conditions around the world and he knows his game in T20 probably better than he does in other forms and he certainly showed that the other night [second T20I against Pakistan]. He's a shrewd operator." "Tim is progressing nicely and he'll be with us this week [in Wellington] to help work with his rehab," Hesson said. "He's unlikely [to play the Australia ODIs]. We'll focus on the Test series at this stage and make sure that he's firing. We certainly won't force him playing any games earlier than that unless we need him. He could well play a Plunket Shield game to get him ready for the Tests." 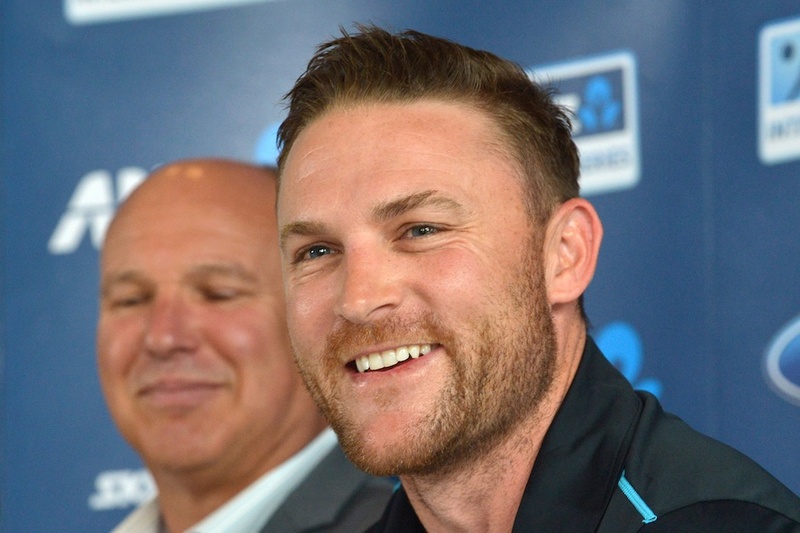 McCullum is set to return for the final game of Pakistan's tour of New Zealand before he begins his last assignment in international cricket. New Zealand's first Test against Australia will be McCullum's 100th, and he is set to retire after the second Test in Christchurch. "He's progressing really well and doing plenty of work away from the game, from a fitness point of view and we're really pleased with the way he's tracking," Hesson said. "Hopefully he'll play a part in the Pakistan series and if he does that will be good prep for the Chappell-Hadlee and beyond." Another fitness concern for New Zealand was Corey Anderson, who has just resumed bowling - one over in the first T20I against Pakistan and four in the second - after playing as a batsman in two matches against Sri Lanka, and for Northern Districts before that. Anderson had suffered a stress fracture of the back during the Lord's Test in May 2015. "I'm delighted how he's coming along and he's certainly confident with the body," Hesson said. We've gone pretty slow with it to make sure that we give him the best chance of being back for a long period. I'm really pleased to give him a chance with the new ball and even happier that he took it. "We'll just keep managing it. It [Test cricket] is not something we're going to push. We've got some pretty clear loads in place to give him a chance of being on the park a lot longer. We've got some one-day cricket coming up and we're hopeful he'll be in a position to be able to play a decent role in those." New Zealand play the final T20I against Pakistan in Wellington on January 22. The series is level 1-1.